A rumour had begin to circulate that amiibo for Pokémon Trainer and Solid Snake were on the way. The Rumour came to life when an out of focus image made its way onto the internet. 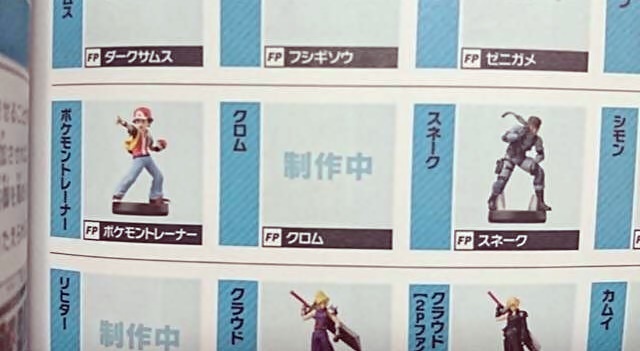 The image showed what looks to be a page in a book with a close up on the Pokémon Trainer and Snake amiibo. The rumours expanded to Squirtle and Ivysaur also getting their own amiibo as well. It turns out that the rumours are indeed true as the page belongs to a brand new guide for Super Smash Bros Ultimate in Japan. The official Smash Bros Japan Twitter account have announced the new guide which has 836 pages dedicated to everything Super Smash Bros. Ultimate and gives a thorough look at all the spirits as well. We would like to thank Nintendo Wire and Amiibo News for bringing this information to our attention and for pursuing the rumour.